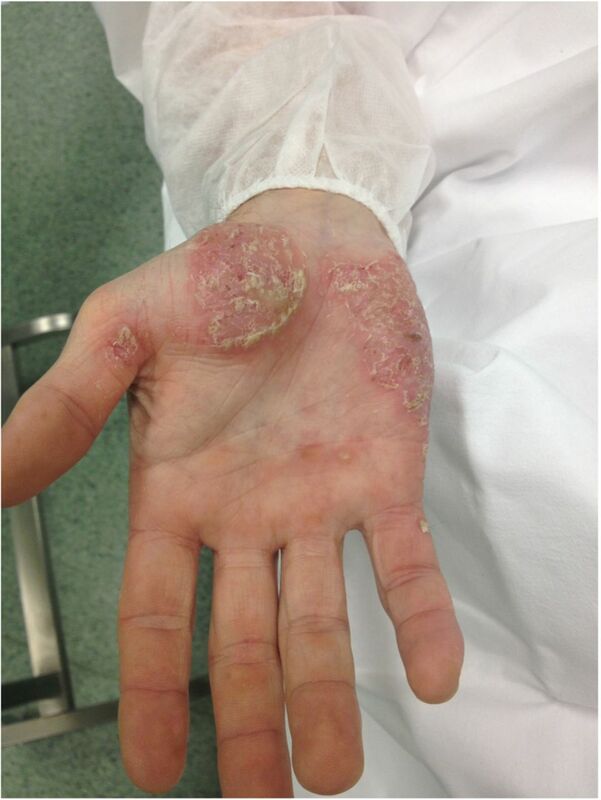 A 32-year-old Crohn's disease patient developed psoriasis after nine infusions of scheduled infliximab treatment at the dose of 5 mg/kg. A 2008 systematic review identified all cases of TNF-α-antagonist-induced psoriasis within the literature, revealing more than 110 reports of patients developing new-onset psoriasis while receiving such treatment, or experiencing paradoxical worsening of existing psoriasis.5 Almost 50% of these patients were receiving treatment for rheumatoid arthritis, 22% for a seronegative spondylarthritis and 16% were receiving treatment for IBD. Mechanism of paradoxical inflammation induced by TNF antagonists. There are currently three TNF antagonists available for IBD, infliximab, adalimumab and certolizumab pegol. TNF antagonists bind to TNF-α, a cytokine with proinflammatory effects in the mucosa. Soluble TNF-α is cleaved from membrane TNF-α (mTNF-α) and binds to the TNF-receptors TNF-RI and TNF-RII, inducing secretion of proinflammatory cytokines and inducing apoptosis by activating caspase 8. In addition, reverse signalling of mTNF-α induces apoptosis of lymphocytes and macrophages by activating the intrinsic mitochondrial apoptosis pathway.8 It has been suggested that infliximab and adalimumab activate the reverse mTNF-α signalling pathway by binding to mTNF-α, thus inducing the apoptosis of macrophages and lymphocytes that is key for the therapeutic effects of TNF antagonists in IBD (figure 2). (A) The tumour necrosis factor (TNF) antagonist infliximab binds with the Fab fragment to the membrane TNF-α (mTNF-α). Reverse signalling is initiated leading to apoptosis. (B) Infliximab binds with the Fc region to the Fc-gamma receptor I (FcγRI; CD64) and to the Fc-gamma receptor III/II (FcγRIII/II; CD16/32) expressed by monocytes and macrophages. Activation of macrophages by Fc-gamma receptor induces secretion of interleukin (IL)-23, which drives the production of IL-17 and IL-22 by T lymphocytes required for the development of psoriasiform skin lesions. Ustekinumab binds to the p40 subunit of IL-12 and IL-23 and neutralises both IL-12 and IL-23. Studies in experimental autoimmune enzephalomyelitis (EAE) and patients with multiple sclerosis have shed some lights on these paradoxical effects of type I IFN. 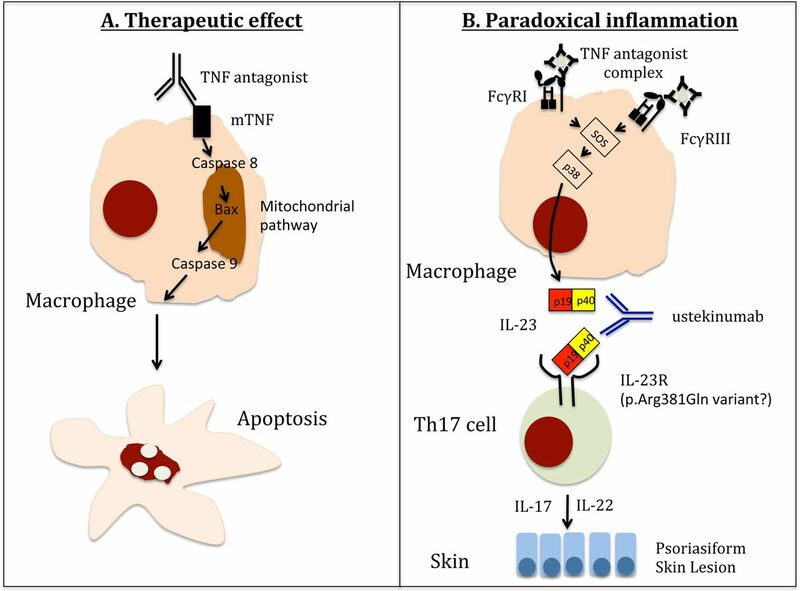 The type I IFN IFN-β is able to suppress Th1-mediated EAE, but has been shown to exacerbate Th17-mediated EAE.12 Hence, the presence of type I IFN in psoriasis-like skin lesions induced by TNF antagonists could augment IL-17/IL-22 responses leading to psoriasis-like skin lesions, although this remains speculative. In the study by Tillack et al9 62% of patients improved with topical therapies, a proportion similar to that observed previously.13 The switch from infliximab to adalimumab did not lead to significant improvements in anti-TNF antagonist-induced skin lesions. In patients who failed to improve with topical therapies, Tillack et al9 stopped TNF antagonist treatment and introduced ustekinumab (an antibody directed against the p40 subunit of IL-12 and IL-23). IL-12 is of importance for differentiation of naïve cells into Th1 cells. TGF-β and IL-6 drive the differentiation of naïve cells into Th17 cells (that also produce IL-22). IL-23 interacts with differentiated Th17 cells (by binding the then expressed IL-23 receptor) to stabilise and expand Th17 cells. The IL-12–Th1 axis is critical for the development of Crohn's disease.14 The importance of Th17 expansion for the pathology of Crohn's disease is under debate. Blocking of IL-17 with human anti-IL-17 antibodies failed to induce remission in Crohn's disease patients.15 In contrast to Crohn's disease, blocking of IL-17 with human anti-IL-17 antibodies can induce clearance of psoriasis.16 By binding the p40 subunit, ustekinumab blocks both IL-12 and IL-23. Ustekinumab improves flares in patients with severe Crohn's disease resistant to treatment with TNF antagonists17 and is used to treat patients with psoriasis. In the study by Tillack et al9 the psoriasiform skin lesions improved in all patients treated in two independent centres without significant flares of their Crohn's disease. Ustekinumab is approved for the treatment of psoriasis. For Crohn's disease phase II studies with ustekinumab have been reported17 and patients are currently recruited for phase III studies. The switch to ustekinumab may be an option in Crohn's disease patients with psoriasiform skin lesions not responding to topical therapies who require ongoing therapy for Crohn's disease.
. Efficacy of biological therapies in inflammatory bowel disease: systematic review and meta-analysis. Am J Gastroenterol 2011;106:644–59.
. Sarcoidosis appearing during anti-tumor necrosis factor alpha therapy: a new “class effect” paradoxical phenomenon. Two case reports and literature review. Semin Arthritis Rheum 2010;39:313–19.
. Tumor necrosis factor-alpha antagonist-induced sarcoidosis. J Clin Rheumatol 2010;16:274–9.
. Psoriatic skin lesions induced by tumor necrosis factor antagonist therapy: a literature review and potential mechanisms of action. Arthritis Rheum 2008;59:996–1001.
. Severe skin lesions cause patients with inflammatory bowel disease to discontinue anti-tumor necrosis factor therapy. Clin Gastroenterol Hepatol 2010;8:1048–55.
. Autoimmune diseases induced by TNF-targeted therapies: analysis of 233 cases. Medicine 2007;86:242–51.
. In vivo single-photon emission computed tomography imaging of apoptosis in Crohn's disease and anti-tumour necrosis factor therapy. Gut 2007;56:461–3.
. Anti-TNF antibody-induced psoriasiform skin lesions in patients with inflammatory bowel disease are characterised by interferon-gamma-expressing Th1 cells and IL-17A/IL-22-expressing Th17 cells and respond to anti-IL-12/IL-23 antibody treatment. Gut 2014;63:567–77.
. Fc gamma receptor CD64 modulates the inhibitory activity of infliximab. PLoS ONE 2012;7:e43361.
. CD69 regulates type I IFN-induced tolerogenic signals to mucosal CD4T cells that attenuate their colitogenic potential. J Immunol 2012;188: 2001–13.
. T helper type 1 and 17 cells determine efficacy of interferon-beta in multiple sclerosis and experimental encephalomyelitis. Nat Med 2010;16:406–12.
. Paradoxical inflammation induced by anti-TNF agents in patients with IBD. Nature reviews. Gastroenterol Hepatol 2012;9:496–503.
. Proinflammatory cytokines in the pathogenesis of inflammatory bowel diseases. Gastroenterology 2011;140:1756–67.
. Anti-interleukin-17 monoclonal antibody ixekizumab in chronic plaque psoriasis. N Engl J Med 2012;366:1190–9.
. Ustekinumab induction and maintenance therapy in refractory Crohn's disease. N Engl J Med 2012;367: 1519–28. Contributors JHN and SD reviewed the literature, wrote and edited the manuscript. Funding JHN is supported by the Deutsche Forschungsgemeinschaft (DFG; grant Ni575/7-1). Competing interests JHN does not have any competing interests. SD has served as a speaker, a consultant and an advisory board member for Schering-Plough, Abbott Laboratories, Merck & Co, UCB Pharma, Ferring, Cellerix, Millenium Takeda, Nycomed, Pharmacosmos, Actelion, Alphawasserman, Genentech, Grunenthal, Pfizer, Astra Zeneca, Novo Nordisk, Cosmo Pharmaceuticals, Vifor, and Johnson and Johnson.